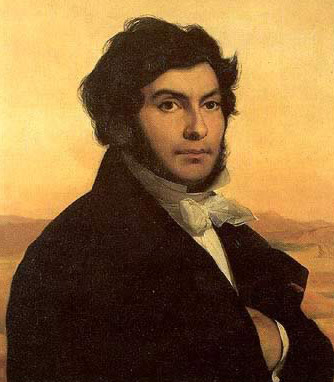 On the 15th July 1799 soldiers under the command of a lieutenant of engineers, Pierre-François Bouchard, were digging foundations for an extension to Fort St. Julien at El Rashid in Egypt when their pick axes and shovels uncovered a slab of black rock with one side covered in masses of engraved text. 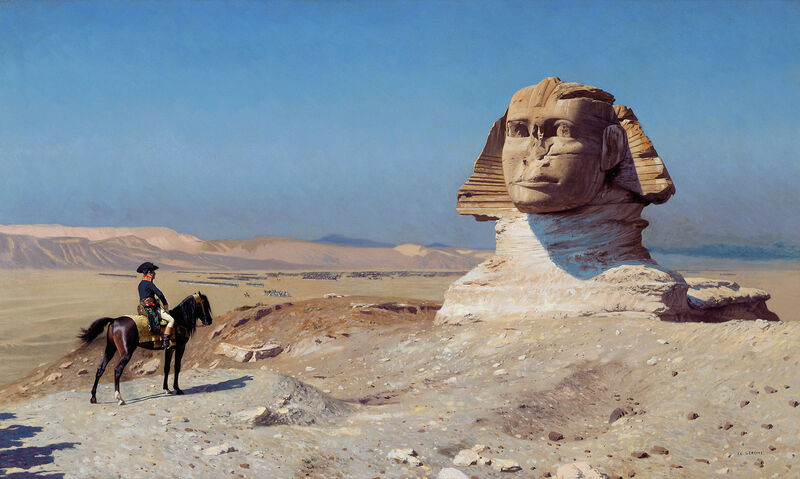 Luckily for history, Napoleon’s campaign in Egypt was accompanied by a large body of experts from a variety of disciplines from the Commission des Sciences et des Arts and Bouchard immediately recognised that the stone he had found at El Rashid, then known as Rosetta, would be of interest to the scholars. The first report of the find, just a few days later, by Michel Ange Lancret noted that it contained three inscriptions, the first in hieroglyphs, the second being a language as then unknown and the third in Greek. Lancret rightly surmised that the three inscriptions would be versions of the same text so hopes were raised of it perhaps being able to unlock the secrets of Egyptian hieroglyphs that had completely defeated scholars. 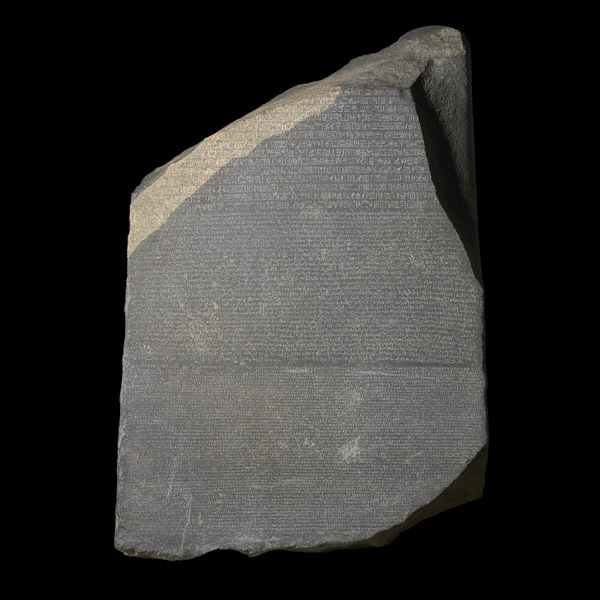 By the time Napoleon himself inspected the find on its arrival in Cairo shortly before his return to France in August 1799, it had already begun to be called la Pierre de Rosette, the Rosetta Stone. 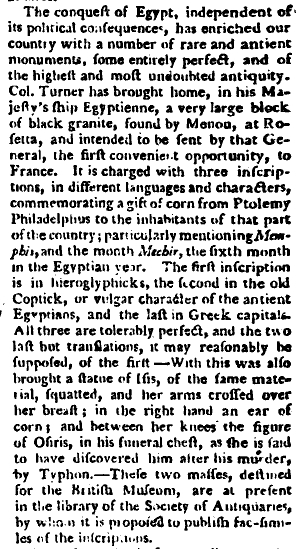 A few months later, in 1800, a gifted linguist attached to the French army in Egypt recognised that the middle text was written in the Egyptian demotic script, rarely used for stone inscriptions and, therefore, seldom seen by scholars at that time. For the next 18 months, following the departure of Napoleon back to France, the remaining French forces were gradually worn down and ultimately surrendered to the British at the end of August 1801 whereupon the Rosetta Stone passed into the possession of the British Army. The grandly named, Colonel Tomkyns Hilgrove Turner escorted the stone back to England where it was presented to King George III in February 1802. The King decreed that it should be placed in the British Museum where it was assigned the inventory code EA 24, EA standing for Egyptian Antiquities. It has been on display there ever since except for two years during World War 1 when it was removed due to fears of German bombing and housed in a station of the Postal Tube Railway 50 feet below Holborn. Over the next twenty years scholars worked on the tablet and after initial breakthroughs by Silvestre de Sacy and the key discovery by Thomas Young that the cartouches contained phonetic characters. This led to Jean-François Champollion being able to construct an alphabet of phonetic hieroglyphic characters which was published in 1822. It is perhaps fitting that the crucial break in deciphering the hieroglyphs should have been made by a French scholar.